Responsibility for the attack was claimed by the Ahvaz National Resistance, which has for decades fought the Persian Shiite regime for a Sunni Arab state in the oil-rich Khuzestan province. Four underground groups banded under this heading represent some 2 million Arab Sunni adherents, who account for around 40 percent of the province’s population and make up most of the workforce at the oilfields. Sporadic protests and unrest are brutally beaten down by the IRGC with extreme measures like induced famine. But the shooting attack on Saturday, by four gunmen clad in Iranian army uniforms, was the worst the elite IRGC had faced and appeared to have meticulously planned well in advance. 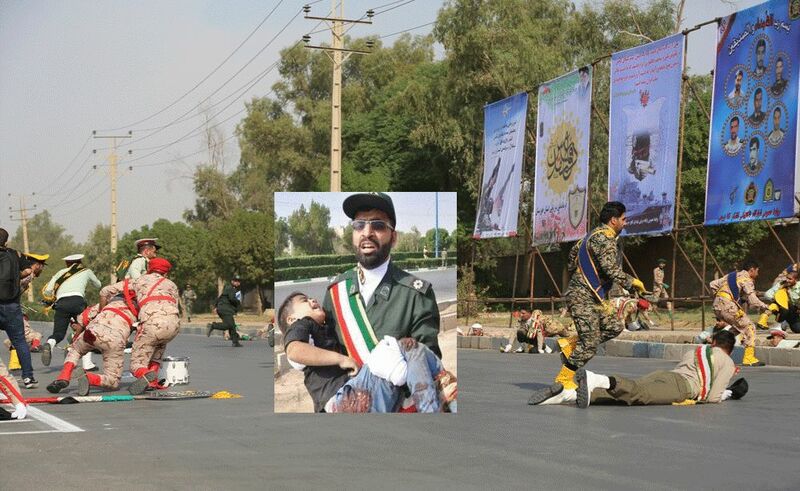 The gunmen zoomed in on motorbikes, a favored vehicle of IRGC goons, and opened fire on the saluting stand and the military parade marching at the time causing chaos and panic. Tehran customarily accuses three parties for inciting anti-Shiite terror: Saudi and UAE intelligence and the US CIA. This time the Iranian military spokesman added the Israeli Mossad to the roster and charged the Saudis with arming and sending the terrorists. The ayatollahs’ regime also has its hands full against another restive ethnic minority, the Kurds of northwestern Iran. Their underground movement is led by the Kurdish Democratic Party of Iran (KDPI or HDKA) and the armed Kurdish opposition PJAK. From bases on the Iraqi side of the border, they mount periodic raids on Iranian patrols and IRGC border posts. On July 21, they killed 11 Guardsmen in the Marivan area and blew up a large Iranian ammunition store. The IRGC hit back on Sept. 8 with long-range missile mire on the main Kurdish command centers in eastern Iraq, killing 17 Kurds and injuring 40. This cross-border assault by Iran did not raise any international interest. During August and September, Iran concentrated large numbers of Iraqi Shiite militia proxy fighters in Iraq’s western province of Anbar, recently arming them with long-range surface missiles. They are on standby for (a) intervening in the Syrian war if Tehran deems this necessary; (b) as a reserve force for crossing into Syria in the event of a war erupting between Hizballah and Israel; and (3) to step in to quell the riots and attacks on Iranian institutions and missions raging in Iraqi Shiite cities, including the oil city of Basra. Tehran fears that this tide of anti-Iran disaffection if it gets out of control will eradicate Iranian influence in Baghdad. Iran is also up against active opposition to expanding its foothold in the Red Sea region from the US, Saudi Arabia and the UAE. All these setbacks are symptomic of a weakening at the core off the Shiite regime in Tehran and its intelligence agencies, under the crushing burdens of mounting terrorist attacks by minority groups in southern and northern Iran and Tehran’s drive for dominance on major external fronts, Syria, Iraq and Yemen, amid crippling US economic sanctions. In these circumstances, the regime in Tehran is bound to hit back at its enemies with the “resolve and swiftness” promised Saturday its military spokesman pledged after the Ahvaz attack. This entry was posted on September 23, 2018 at 9:58 AM and is filed under Uncategorized. You can subscribe via RSS 2.0 feed to this post's comments. You can skip to the end and leave a response. Pinging is currently not allowed. 1- Preparation for the victimization rhetoric in the upcoming UN assembly. 2- Neutralizing the much expected Trump’s attempt to increase diplomatic pressure on mullahs. 3- Propaganda aimed at the Iranians that if mullahs are weakened, terrorists will take over the country, resulting in Syria-ization and disintegration of the country. 4- Vilifying political opposition groups which fight for ethnic minorities rights. 5- Diversion of people’s attention from hourly economic deterioration. 6- Blaming other countries for not only economic free fall, but for bloodshed( US, Israel, Arabs, etc). 7- Finally , rally round the flag effect. 1- The spokesman for the main group of Al-Ahvaz has denied responsibility. 2- The overwhelming majority of the Iranians believe it was carried out by the regime, given similar past killings to create false flag and rally round the flag effects.